We’re constantly acquiring new tips and tricks from beauty biz experts, female celebrities, and notable influencers. But beauty inspiration can be captured anywhere. And for me, music (and the people who make it) is a constant source of influence—from women, of course, but from their male counterparts as well. Hair is hair and faces are faces—there's no longer a need to add binary labels to the equation. 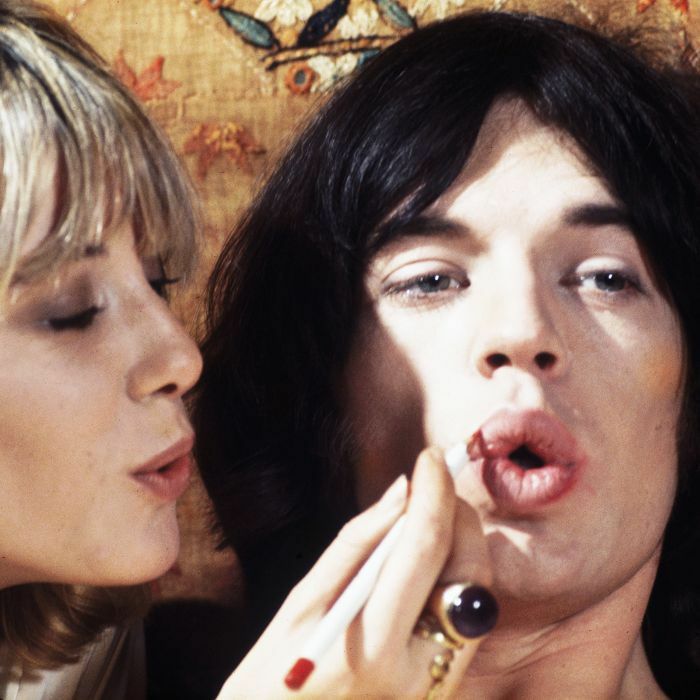 Brilliant performers like Mick Jagger, David Bowie, and Jimi Hendrix have more to offer us than great tunes and good genes, particularly in the beauty department. Behold every beauty lesson I’ve learned from some of the most accomplished men in music. When it comes to swagger, this Brit has it in spades. Aside from reveling in his gorgeous locks and plump, signature lips, let us all take a moment to reflect on his outstanding hat-wearing abilities. The lesson? Skip your favorite dry shampoo, massage in a hydrating mask, and opt for a wide-brim hat to make it fashion. Kurt Cobain, the man who made a cameo in all of my grunge-soaked fantasies, sported the original textured bob and lived-in color. Now we can scroll through our feeds and find well-lit photos of blondes with subtle, seemingly slept-in waves and piece-y chops. But just look through images of Nirvana’s front man and you’ll see the same thing. I have Cobain to thank for the Anh Co Tran bobs I dream about every night. I’ve learned I don’t have to worry about upkeep as much, because he certainly didn't, and his hair looked pretty damn near perfection. The inimitable David Bowie taught us all so much about beauty. He was at the forefront of androgynous fashion during a time when very few people found it acceptable to dress however you please. He wore glitter, eye shadow, and he even made an eye patch look covetable. The most important trait, though, was his brilliant ability—through all the costumes and makeup looks—to remain undoubtably authentic. The beauty lesson here is to do you. Though he’s not the first to come to mind when I think of rock stars, he is a jack-of-all-trades. So he counts. Pharrell is on another level when it comes to glowing skin. The 42-year-old producer has a glowing, line-free mug and doesn’t mind discussing how to care for it properly. In an interview with Into the Gloss, Pharrell explains, “You have to clean your face. You can’t sit around and assume it’s going to be okay. I wash my face every day—don’t be afraid to wash yours before you go to bed.” He added, “Years and years and years ago, Naomi Campbell pulled me aside and said, ‘Listen, this is what you have to do—you have to go to a dermatologist.’” Skincare advice from Naomi Campbell through the mouth of Pharrell? Jimi Hendrix is famous for a lot of things, championing his natural texture is yet another thing to add to the list. During a time when women and men of color were encouraged to change their hair to fit into an oppressive mold, Hendrix became known for his afro. Air-dried hair is a freeing experience, so who better to thank than the Are You Experienced man himself? Dubbed the “swag” (a swingy shag), Tyler’s signature ’do has made its way from the stage to the present-day streets. The razored texture, long layers, and parted bangs are so divinely ’70s that it’s only natural women all over the world have fallen for the look. Seems like Steven Tyler taught us all a lesson in cool-girl hair before the contemporary designers did. Re-create his texture with Oribe Dry Texturizing Spray ($44). Ombré hair color is a trend that will not quit. Though different iterations have popped up (sombré, dip-dye), the look is still wildly popular and consistently requested at salons. Enter Jared Leto. The Oscar-winning actor and lead singer of Thirty Seconds to Mars has the sun-kissed style of our dreams. So much so, I've brought photos of it in with me to show my colorist. The lesson here is that good is hair is good hair—regardless of whose head it's on. Keep your highlights from fading with Christophe Robin's Shade Variation Care in Baby Blond ($52).